Every four years, there's another World Cup. Every World Cup gets a new game ball. And since 1970, that ball has been made by Adidas. 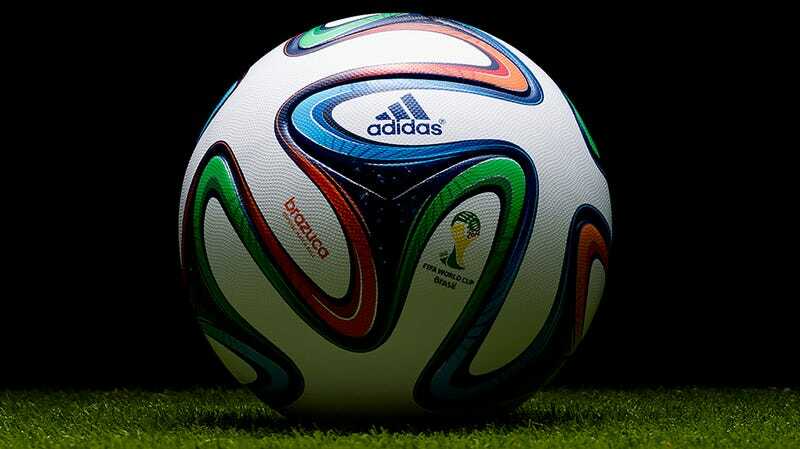 Enter Brazuca, the official game ball for World Cup 2014. It's different, which is great—especially for players who find themselves in need of a scapegoat. Disclosure: We were so excited to check out Brazuca in all its glory that we let Adidas fly us out and put us up at the company's Portland HQ for a World Cup media event. What's so controversial about Brazuca? For starters, it has six panels. Six! A standard soccer ball has 32 panels, and looks a lot like Adidas first World Cup ball, the 1970 Telstar. It's typically marked by 12 pentagonal and twenty hexagonal panels that are positioned to give the ball a spherical geometry. But what fun would it be if every World Cup ball was the same as the ball you kicked around in high school? This is the first Adidas-made World Cup ball, the 1970 Telstar. In 2006 in Germany, Adidas strayed from that traditional 32-panel design with a 14-paneler called +Teamgeist. Then in 2010 in South Africa, it trimmed off another four with the 10-panel Jabulani. Some players—specifically goalkeepers—argued that the new ball is too light and unruly, and that it would result in goals scored that would have otherwise been deflected. There's some evidence that there may have been some credence to those accusations; the ball dealt with drag differently than those used in the European leagues, which made it more difficult to defend on free kicks. This is the 2010 game ball, Jabulani. But Adidas seems to feel pretty confident that six panels are the way to go, and our foot-on impressions from when we got an up close look last month in Portland back them up. Disclaimer: I am not a professional soccer player. The last time I played competitive fútbol was in an elementary school YMCA league where everyone got a trophy. We weren't allowed to take any pictures, but we did have a few moments to bounce Brazuca (approximate translation: "inherently Brazilian"). It's light and easy to handle and easy to grip in one hand, even if your hands are shrimp hands. It responds quickly to movement, making for a more reliable ball. I was surprised at how easily it bounced and went where I wanted it to go. In fact, some players have compared it to the Champions League ball, a ball made of star-shaped panels that is known for reliability. As for looks, those panels aren't the hexagons you might be used to from your rec league; instead, it appears as though it's made of six identical interconnecting boomerangs. The version I saw in person was white—one of the last test versions before the official ball's official unveiling today. The version that will be used in Rio is decorated with vibrant, swirling, ribbon-like design, inspired by Brazilian wish bracelets. If you're not familiar, wish bracelets are ribbons Brazilian children wear and don't remove so that the wish comes true. This ball is nothing if not committed to a theme. As for specs, Brazuca weighs 437 grams (slightly lighter than Jabulani) and is 69 centimeters in circumference, which is well within the requirements of a normal sized ball. Adidas engineers insist that the panel sizes comprise the perfect geometrical formula for a soccer ball, though it's not clear what that means exactly—or why it's preferable to all the other balls that make the same claim. Brazuca's shape is meant to give the ball better grip, make it more stable to handle, and improve its aerodynamics. Essentially its meant to be a ball for every player, no matter the position. A more democratic ball, if you will. Brazuca went through rigorous rounds of testing by both machines and people. For example, we were shown footage of it being kicked by a mechanical foot over and over, as well as a reel of it being pressed between two mechanical arms. And Adidas secretly dropped it into regular old league games to see how players responded. In a way, Brazuca seems to be a direct response to the criticism from players of specific positions in years past. In 2010 it came from goalkeepers. In 2006, some players thought the ball favored strikers, and in 2002, it was thought to be made for technical players. Whomever ends up pointing the finger at Brazuca this go-round probably depends on how many goals are scored, but the one thing that's certain is that Adidas tested the living crap out of this thing. Pressure tests? Yup. Water absorption tests? You bet. Altitude and rebound tests? Of course. Really, Adidas touts it as the most tested ball of all time, perhaps preempting some of the criticism that the ball will no doubt be the target of over the next six months or so. There were about 18 steps that went into the process before FIFA approved it, starting with the concept phase, to lab tests, to feasibility tests, followed by umpteen adjustments and several field tests by upwards of 600 players. The only test that matters, though, will come in June, when actual games are played and won and lost. That's when we'll know if Brazuca is a hero or a culprit. Or, more likely, who will inevitably be pointing their fingers its six-paneled direction.